Guatemalan police officers who work in schools visited Miami this week as part of a capacity building program organized through the US State Department. Students from the high school Police Explorers program wore gory makeup to play the part of hostages. Dozens of officers from multiple agencies were present for the drill. 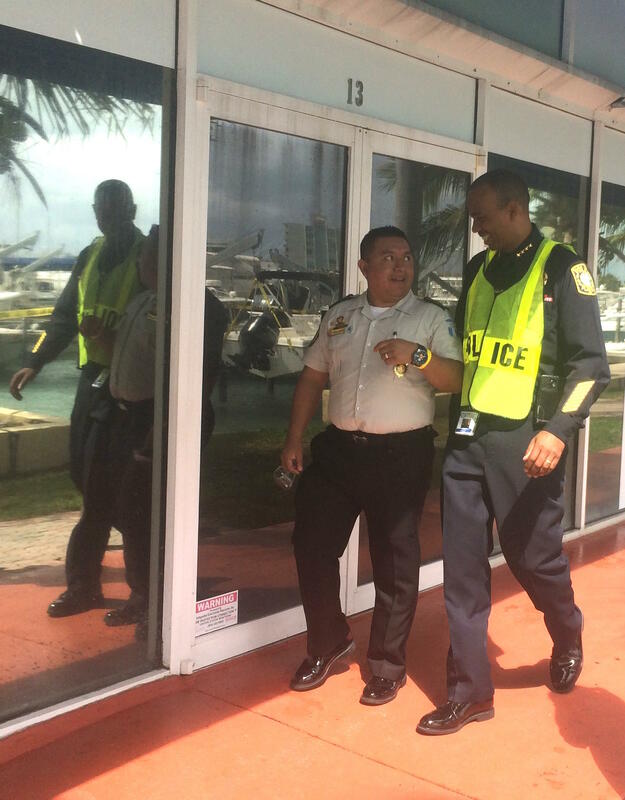 Guatemalan and Miami officers traded thoughts on the drill as they took shelter from the rain. “We don’t have this experience of working in coordination across agencies,” said Axel Romero, Guatemala’s vice minister for crime prevention. Romero watched North Bay Village police direct traffic as a drone operator fed footage from overhead to staff with Miami-Dade Fire Rescue. “We don’t have these problems about terrorism, but we have to deal with gangs and gunshots, and we have to deal with drug-dealing,” Romero said. Jose Antonio Tsuban Gomez, a police commander in Guatemala, is working with Miami-Dade Schools Police Chief Ian Moffett to train the 500 officers he oversees in gang prevention and other school-based strategies already used in Miami. While Guatemala has been spared the worst of the gang violence that plagues nearby Honduras and El Salvador, organized gangs have become a menace in parts of the capital city, extorting staff and using schools as recruiting grounds. Thus authorities in the country are in the process of creating a specialized police force to work with the 3 million students in the nation’s public schools. A unit of 500 officers with the national police force is adopting gang-prevention strategies already used by Miami-Dade school police. Miami-Dade County’s population is one of the world’s most cosmopolitan. And its police force reflects that. In 2012, the State Department decided to put that diversity to use beyond our borders. State recruited Miami-Dade police to help train and build law enforcement in Guatemala, Haiti, Jamaica and even Egypt. Federal officials say it worked out so well that this week they re-upped the Miami-Dade force for another five years.